The photobooth at our wedding was a huge hit! There was a line almost all night - and the best part of the day after our wedding was looking at the hundreds of goofy pictures and comments people made in our guest book! And my friend Adrianna put this together of all of the pictures my besties took while in the photobooth! 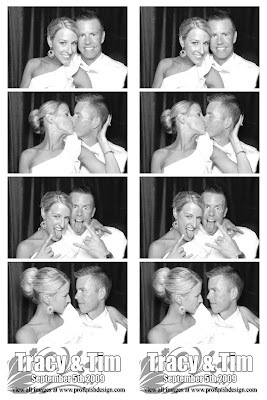 Profinish Design in Sacramento did the photobooth for us thanks to a recommendation from our wedding planner, Kendra. Such a fabulous idea! Way better than a regular guest book and it has such a vintage feel in black and white. love the photobooth!! i can't wait to have one at my wedding, such a personal touch from every guest!! That is such a cute idea! I love using the pictures in the guest book...so neat! What a great idea! I am definitely looking into this for my wedding! Love this idea! I went to a wedding that had this and it was a blast! We are doing the same thing at our reception and I am so excited for it. We order the book with the extra prints too!! Love this idea! 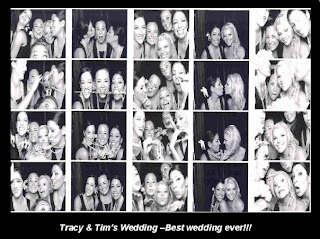 my bestie had a photo booth at her wedding too! it is such a fun idea!! so awesome that 2 prints came out so you will have the great memories as well!! i love it!! So cute! We had a photobooth and our Wedding too. Everyone loved it! I've heard that they are a blast! I mean who doesn't love photo booths. What a great memory for you two to have! love the photobooth! i think every wedding should have it. and you (the bride and groom) get a keepsake album from the night which is such an awesome momento! OH MY GOSH BEST IDEA EVER!!! that books is amazing...and i LOVE the personalization of it is just incredible!!! i would love to have something like that to treasure for years to come!!! AWESOME! 2 weddings I attended had photo booths and it really is such a great idea!! Not too much, just enough...yanno? Love it! That is the coolest thing EVER! I love it! first off.. thanks for all your sweet comments and support. i appreciate it. now.. i LOVE the photobooth idea! seriously, i am so envious of your wedding. you seem to have had the dream wedding. lucky lady! :) you and TL are soooo darling together. So fun! And I love that all the pictures went in a guest book! what a great idea for the guest book! it is a lot more personal and way more fun to look at later. Such a totally adorable idea...it's not even FUNNY what a cute idea that was! How fun! Ours was a HUGE hit as well! Like you said, no one really gets shy and it was a hit for ALL ages! So funny to look through the pics! WOW That is so cool! I wish we could have had one at ours! What a GREAT idea!!! I love it!! You had this at the wedding? I love it!!!!!!!!!!!!!! What an awesome idea... I can't even imagine how fun the pics must have been to look through!! What a great keepsake!! That is probably the best wedding idea I've ever heard! Such a fun idea! I love these at parties. A great token to take home from a party or celebration. OMG that is an awesome idea!! Micahel and I just took some photo booth pictures yesterday to be silly!!! I love that idea..I might just steal it from you..if you don't mind. It might be a while though! I wanted to do a photo booth so badly. I think this is such an awesome idea and I love how your guest book turned out. So cute and totally worth it! 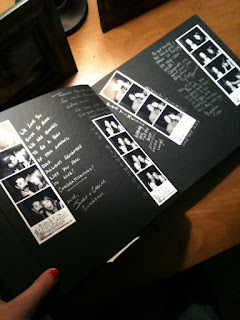 What a fun idea, I love it personalizes your signature book, plus how fun that they are all black and white. You and your man look great too, how adorable! I love photobooths! I really like your photobook. You're going to love going through it! that is the coolest guestbook ever!! I love, love, love it! aw thanks i'm glad you like my blog! and i have to say - i've been poking around yours for an embarrasingly long time so the feeling is mutual :) SUCH CUTE pictures! I love this idea! you looked beautiful! i looove your dress! Oh and I stole your carrie bradshaw quote! hope you dont mind! I love that quote! congrats on the wedding you guys look great together!!! I adore the photobooth idea! How fun and what a great memory!